Inadequate nutrition – what are the consequences? When an animal is sick, special chemicals made in the body (called pro-inflammatory cytokines) promote several distinct changes, most notably increased protein breakdown, decreased protein synthesis, and accelerated energy expenditure. Simply stated, fat tissue is conserved in the face of breakdown of lean tissue like muscle. This is not an efficient process and can have disastrous effects. Inadequate nutrition causes cells of the intestinal lining (enterocytes) to shrink and lose function; this process is called atrophy. Bile flow slows down and certain essential enzymes from the GIT and pancreas that help digest food aren’t adequately secreted. Cardiac arrest, respiratory failure and suppression of the immune system are possible sequelae of severe undernutrition. As a profession, veterinarians need to consistently do better in providing adequate nutrition for hospitalized sick patients. This population commonly becomes deficient in both protein and calories, further increasing the risk for additional health complications. A previously published study by a board-certified veterinary nutrition specialist showed only 27% of dogs studied had a positive energy balance during hospitalization, meaning only a quarter of the dogs received the nutritional support they needed. This was an unfortunate finding, as patient outcome and caloric intake have been directly related. 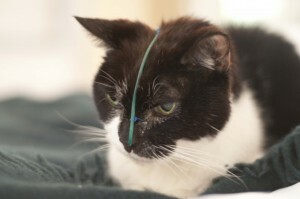 In contrast another study conducted by a veterinary nutrition specialist confirmed patients with temporary supplemental feeding tubes placed during hospitalization tended to receive their feeding prescription. A pet should not be allowed to received inadequate nutrition unless a family imposes restrictions that prevent the recommended nutritional support. 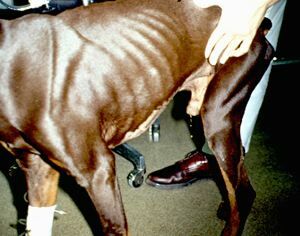 A dog with marked weight loss characterized by loss of muscle. Note the prominence of the rib cage. There is mounting evidence early nutrition in patients with major illnesses is well tolerated and positively affects patient outcome. Therefore a veterinarian should correct any of the above-listed derangements as quickly as possible, and then appropriate nutrition should be provided immediately. If a patient requires sedation or anesthesia for a diagnostic test and/or therapeutic procedure, one should consider concurrently placing a temporary supplemental feeding tube at that time. Patients unable to protect their airway should not be fed by mouth, but should be supported via a temporary supplemental feeding tube and/or intravenous nutrition (called parenteral nutrition). Similarly for patients with a completely dysfunctional GIT, parenteral nutrition can be used either alone or ideally in conjunction with normal feeding to provide nutritional requirements. This type of support is relatively complex, and is typically best provided by either a board-certified veterinary critical care specialist or board-certified veterinary nutrition specialist. 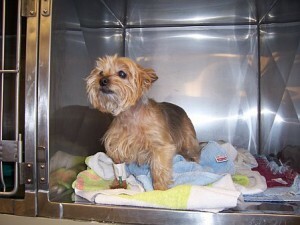 Sick pets require proper nutrition to help them beat their illnesses. Giving medications will only help so much! A pet’s body has to help in the healing and recovery process, but will not be able to do so appropriately if it does not have the adequate resources to do so. Providing proper nutrition supplies the vital building blocks of protein, carbohydrates and fats for a body to mount a meaningful response to illness and help improve the likelihood of a positive outcome. To find a board-certified veterinary nutrition specialist, please visit the American College of Veterinary Nutrition.